We are excited to participate in the following genealogy seminars and workshops. If you are in the area, please stop by our booth to say hello. 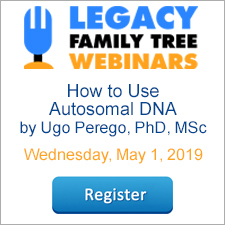 You can ask the Legacy Family Tree experts questions and take advantage of special seminar discounts. USA | Arizona | Youngtown - January 26, February 2, 9, 16. West Valley Genealogical Society. 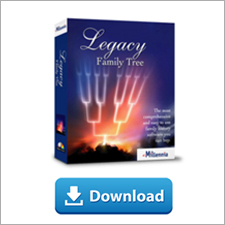 Genealogy Technology 4-week course taught by Legacy's Geoff Rasmussen. Topics include digital images, social networking with blogs, message boards, etc., research guidance tools, mapping, genealogy software tips, sharing information electronically, timelines, and much more. Pre-registration is required, and seating is limited. Visit http://www.azwvgs.org/Classes.htm for more information. USA | Utah | Highland - February 26-27, 2010. At this annual multi-stake family history fair, Leonard Plaizier will teach a class on Legacy and answer your questions at the Legacy table. Held at the LDS church building on the corner of 9600 North 6800 West in Highland. Classes run Friday from 7:00-9:30pm and Saturday from 9:00am-12:30pm. Contact Lorie Stout for more information. When are you going to hold some classes in Florida? OK. Geoff is from Minnesota. When is he going to return to his homestate and lead some classes in Legacy. Arizona is fine but heck there are a lot of us here that could use the leadership. Just because there is 2 1/2 ft. of snow outside my door shouldn't disuade him.